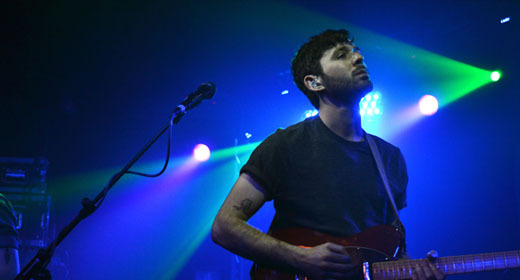 The Antlers are a refreshing change on record from the spiky indie guitars and skinny jeans du jour. ‘Hospice’ was the album which brought this Brooklyn based three-piece to most people’s attention. The space and grace of the sound, the lyrical intelligence and the emotional impact of lead singer and chief songwriter Peter Silberman’s voice made it a critics’ favourite. This year’s third album ‘Burst Apart’ builds on the same ingredients, and I was eager to see whether they could translate them to a live setting. Well, er, yes. Big time. From the first three songs along it was clear that this lot mean business live, and that ‘big’ really was the operative word. Opener ‘Parentheses’ featured scratchy, dubby noise, echo, clattering drums from a guest fourth member, and plenty of volume to accompany Silberman’s frankly angelic voice. In ‘No Widows’, there was a point when Silberman held a falsetto soaring note for so long that, when I looked around, I saw that I wasn’t the only one holding my breath in awe. Most bands at this point would take a breather, tune up for a while, tell a few jokes and chuck in a couple of fillers. Not this lot. Rather, they kept up the attack, the volume, the power – playing with pace but barely pausing for breath. Mouths stayed open in the crowd as they continued with ‘I don’t want love’, a stand-out from the new album that should be number 1 by rights. It has everything a pop song should have: hope and despair, melody and flow, hooks and hammers. Agog, me, and slippin’ on tears. At the end the keyboard player tells us they’re feeling about 8/10 but “hope to get to 9 by the next song”. This felt like a conservative score. The next three songs got them “to 9.6” and the confidence of the performance grew still bigger – bassist/guitarist Timothy Mislock taking to the front of the stage and singing along off-mic, Darby Cicci (great name!) pouring sweat and throwing fringe on the keyboards. Meanwhile, Silberman continued to jerk tears – at times conjouring the spirits of Anthony Hegarty and Jeff Buckley, particularly on the stripped down vocals, guitar and keyboard atmos of ‘Corsicana’. All good things come to an end, and encore ‘Sylvia’ was fitting choice. It’s anthemic but not bombastic, epic but not progressive. And always, always, big. Sums The Antlers up well, that does. Original music criticism for Brighton Noise.